If you want to grow in your relationship with Jesus, you need to have intentional relationships with people who have the same goal—and a LifeGroup is the ideal place for that. In a LifeGroup, people come together in intentional community (usually from similar areas of town, similar life stages, etc.) to pursue spiritual growth and healthy relationships. You’ll be encouraged to live out the truths you discover in the Bible as you encourage others to do the same. All ACC LifeGroups share a common goal of both making disciples and building Christ-honoring relationships. With this in mind, each group balances intentional Bible study and prayer, with opportunities to gather together for fun and fellowship. Starter Groups are brand new LifeGroups that meet at the church for the first couple of months. This is the perfect place to jump in if you’ve never been in a LifeGroup before and are a bit anxious about knocking on a stranger’s door. Instead, Starter Groups grow at ACC until a group is ready to move to its permanent location. Most of our groups are open to anyone, regardless of your situation. Typically, we find that each LifeGroup takes on a certain makeup of people with similar interests, backgrounds, or age groups. Whether you are an empty-nester, a widow or widower, a young married couple, or a family of 10 ‐ we have a group that would be perfect for you! We offer Men’s LifeGroups and Women’s LifeGroups in the mornings and evenings. Our Men’s and Women’s groups are mostly comprised of people in both single and married stages of life. There’s no denying that being a young adult has some specific uniqueness when it comes to meeting flexibility and opportunities for fellowship. Our Young Adult LifeGroups are an ideal place to connect with other college-age and young professionals that are navigating this amazing life stage. Groups typically meet weekly, based on leader/group availability. One meeting each month is designed simply for building relationships. This could be a meal together, a game night, a night at an Orioles game, a picnic at the park, or something else! Some of our groups even vacation together! Each LifeGroup serves together once a quarter in some capacity. Unless full, ACC LifeGroups are open to anyone looking to explore their faith and Christian community. Our LifeGroups meet year round (based on the leader’s availability) with a few “OFF” weeks for holidays and summer. Each LifeGroup alternates between a provided discipleship curriculum and a curriculum of interest chosen by the group. 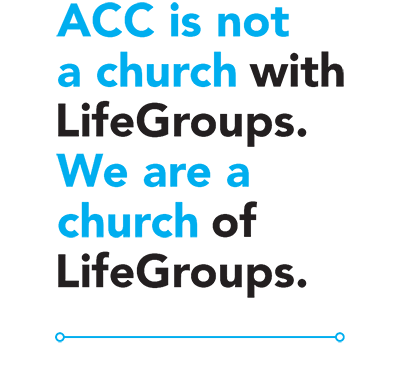 Please contact us if you have any questions about LifeGroups.